SIMBU schools and rural health centres have celebrated an early Christmas with boxes of books and linen gifted by the Toowong Rotary Club in Brisbane. Rotary’s Murray Bladwell and Terry Shelley of Goroka’s Nowek Ltd worked together to deliver the Books for Simbu Schools project, a shipping container of 11,000 books, linen and other health items. 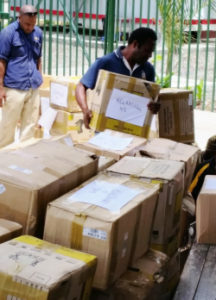 The huge consignment reached Kundiawa on Sunday last week after its long journey from Brisbane’s donation-in-kind yard by ship to Lae and along the Highlands Highway to be distributed at Kondom Agaundo Building in Kundiawa. The gift comprised reading books, text books, teacher resource books, dictionaries, a set of encyclopedia donated by Bob Cleland, library shelving and trolleys, school desks and chairs, as well as the hospital supplies. The project was initiated by one of true men of Simbu and Papua New Guinea, Murray Bladwell, and backed by Toowong Rotary supported by the Donation-In-Kind Brisbane Chapter. Murray, together with his wife Joan, spent their young days in Papua New Guinea as teachers at various schools including Gon in Kundiawa, Chuave and Port Moresby. Nowek Ltd, a company owned by Terry Shelley and his family, funded the container’s shipment from Brisbane to Goroka at a cost of K21,200. Winestar, a local brewing company owned by Terry’s daughter Sarah, then met the cost of the freight from Goroka to Kundiawa at a cost of K4,800; in total, a magnificent gift of K26,000 by the Shelley family. Although now based in Goroka and making his business there, Terry is another of those white skinned true men of Simbu. SimbuHe spent his young days in Simbu working as a cooperatives officer and fell in love with one of Simbu’s beautiful mountain orchids, Lynne from the Kamaneku tribe, and married her. Lynne became Terry’s lifetime partner and they have beautiful children. Charity work is not new to the Shelley family. Nowek Ltd is well known for sponsoring rugby league in the Eastern Highlands. In his youth, Terry was respected, and sometimes feared, as a tough and talented league combatant. On a number of occasions, Nowek and Winestar have supported the Simbu Children Foundation in its charity work. Terry also supported me in cash and kind, including freighting the donations by PNG Attitude readers of a wheelchair, special mattress and vitamin supplements during my health problems. Although hampered by bad weather and lack of funds, the SWA team worked tirelessly and successfully to ensure the books and other materials could be distributed last Thursday in the heart of Kundiawa. The SWA team – comprising Jimmy Awagl, Arnold Mundua, Jimmy Drekore, Mathias Kin, Angela Kaupa and Philip Kai supported by a brigade of young boys – worked through Wednesday night in heavy rain and transferred boxes from Sir Joseph Nombri Memorial Hospital to the Simbu Provincial Government’s events podium. Here they were labelled with the names of the 62 primary schools, 20 high schools and 18 rural health centres. On Friday, the boxes were distributed in a low key ceremony as limited funding meant we were unable to hire a singsing group, usually the big crowd attracters. We had invited Governor Noah Kool and Provincial Administrator Joe Naur who did not make themselves available. They gave no reason but we believe they were ashamed to take the stage because they had not honoured a K50,000 donation that the Simbu Provincial Government promised SWA a year ago. SWA was delighted to welcome the presence of education head Essy Walkaima and health head Jerry Kubu who joined us in distributing the boxes preceded by expressions of appreciation by SWA President Jimmy Drekore and Essy Walkaima. Sarah Shelley was also able to join us. The schools in attendance were overjoyed and thanked Towoong Rotary, Nowek, Winestar, SWA and the Simbu Division of Education. Wara Sua and Kaliwai primary schools from the Nomane Karimui District showed their appreciation by donating K200 and K100 respectively to SWA which we used to offset some of the additional costs incurred. The SWA and Simbu Division of Education will officially thank the Toowong Rotary Club, Nowek Ltd and Winestar with a certificate of appreciation. SWA expresses its heartfelt gratitude and thanks to Murray Bladwell and the Rotary Club of Toowong, Nowek Ltd, Winestar, Essy Walkaima and the Division of Education, Eddie Wem of Haumex Architecture & Building Construction, Arnold Mundua, Mathias Kin’s sons, and the guardians from the hospital. We are very grateful to all of them.